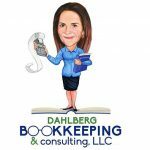 Claudette Dahlberg — founder and owner of Dahlberg Bookkeeping & Consulting, LLC — is a certified QuickBooks Proadvisor with over 20 years of accounting and bookkeeping experience. She specializes in bookkeeping, accounting, payroll processing, and QuickBooks training and troubleshooting. Work For Dahlberg Bookkeeping & Consulting, LLC? Claim This Page.